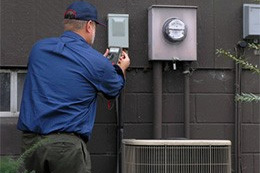 Summer is the time when most people realize how important an AC unit can be to their home or business. Getting a cool breeze to flow through a residential or commercial building is vital to beating the heat – specially in the southern states. Getting by without a working AC unit can be a nightmare, and most people will resort to using large fans in order to stay comfortable if their units start acting up. AC units work hard – there’s no doubt about it. They’re usually left on 24/7, keeping your home or workplace at a comfortable temperature and regulating it whenever the exterior temperatures fluctuate. Because of year-round wear and tear, most of them are known to break down from time to time and need Charlotte AC repair services. Imagine how difficult and nightmarish it would be if your central air system stops working in the middle of the night. Luckily for you, there are plenty of Charlotte AC repair companies that will offer emergency services – but you probably don’t want to let it get that far. Nobody likes waking up in the middle of the night and burning up with the humid heat. That’s why it’s so important to get regular maintenance done on your unit from time to time, specially when the seasons change. The very same Charlotte AC repair service can stop by and do some regular maintenance on it to remove any existing problems and make sure that you don’t end up waking up in the middle of the night to a broken unit and an uncomfortable home.